"Toyota is committed to supporting the community and educational programs that enrich the next generation of manufacturing and distribution professionals," said Jeff Rufener, president of TMHU, located at Toyota Industrial Equipment Mfg. Inc. (TIEM) in Columbus, Ind. "With the Vincennes University Center located so close to our manufacturing plant, it is a natural extension for Toyota to contribute its resources to support the University's material handling and warehouse training programs. The Vincennes University Logistics Education and Training Center features 30,000 square feet of classrooms, cutting edge training equipment and material handling/flexible lab space. In addition, Toyota is also offering the faculty at the Center an opportunity to participate in its "Train-the-Trainer" Operator Safety Program to gain a better understanding of lift truck principles, OSHA requirements, improved pedestrian awareness, training techniques, and trainer responsibility. 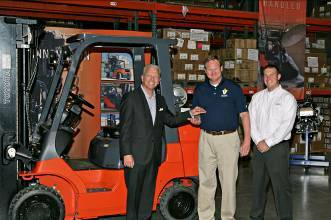 The information gained will help faculty further augment the University's dedicated forklift Operator Safety Training program. The two specially designed Toyota lift truck engines donated will support hands-on instructional use. The engines feature special cut-a-way sections to allow students to see the inner mechanical workings on the engines. Students will also use the donated I.C. lift truck to gain a first-hand account of the required skills to maintain and safely operate a forklift. Vincennes University (VU) is state-supported with campuses in Vincennes and Jasper and additional sites, such as the Indianapolis International Airport. VU also offers instruction at military sites throughout the nation. In addition to offering 200 associate degree and certificate programs, VU also offers bachelor's degree programs in technology, homeland security, nursing, and secondary education programs in mathematics, science and special education. Founded in 1801, VU is Indiana's first college and is the only college in the nation founded by an individual who would later become President of the United States. William Henry Harrison, the ninth U.S. President, founded VU while serving as governor of the Indiana Territory. More information is available at www.vinu.edu. Celebrating more than 45 years in business in North America, TMHU is the supplier of Toyota lift trucks, the number one selling brand since 2002. In addition to the full line of high-quality lift trucks, the company's extended industrial equipment solutions include Automated Guided Vehicles and tow tractors. Toyota's commitment to excellence in customer service extends throughout the U.S. and Canada. With more than 70 authorized Toyota Industrial Equipment dealers and more than 220 dealership locations throughout North America, Toyota dealers offer comprehensive customer service and support, including one stop shopping for both new and used lift trucks, rentals, parts and service, fleet servicing and financing. For more information on TMHU, please visit www.toyotaforklift.com, www.facebook.com/ToyotaForklift or twitter.com/ToyotaForklift or call 1-800-226-0009.